Medpod’s strategic partnership with the leading manufacturers of diagnostic devices and laboratory analyzers has enabled the ideation of innovative diagnostic configurations and a highly advanced integration into the Medpod AMP software platform. Medpod’s software technology gives the remote clinician control of each device and powers the real-time capture, storage and transmission of clinical data, images, audio and videos to facilitate high quality consultations between patients and remote providers. The integration of diagnostic imaging devices and point-of-care laboratory analyzers delivers rapid results and provides critical information to the remote clinician to diagnose patients in their home, the field, an ambulance, a clinic , a school or any other environment. Medpod arms remote providers with data and tools that augment their remote decision capabilities to rapidly make clinically informed decisions and initiate treatment of the patient. 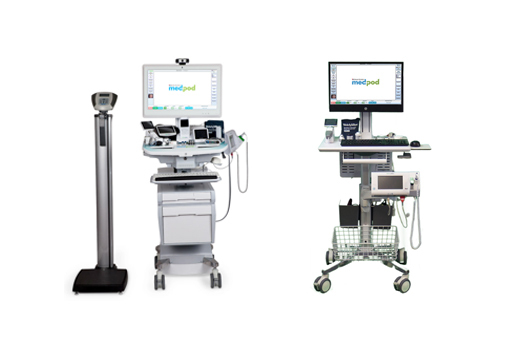 The Medpod telemedicine carts comes fully equipped to deliver primary care functions and can be outfitted to manage advanced specialty care as well. 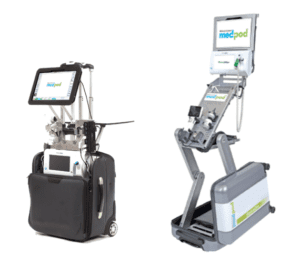 With the ability to deploy in less than 2 minutes, MobileDoc is the ultimate portable practice. Revolutionary in its compact and mobile design, MobileDoc integrates best-in-class professional medical-grade devices with state-of-the-art HD video and EHR connectivity.